After the remains of Saint James the Apostle were discovered–Queen Helena style–in this little Galician village in the ninth century, it became a booming pilgrimage site. In fact, at its height in the 1300s, Santiago surpassed Jerusalem and Rome in the number of Christian pilgrims who visited it. 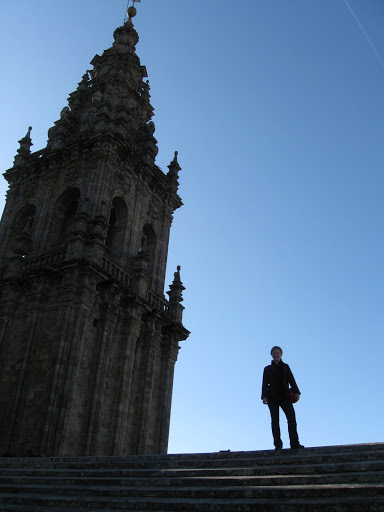 There were many different pilgrimage routes to the town–“caminos de Santiago”–but all led to the same place. 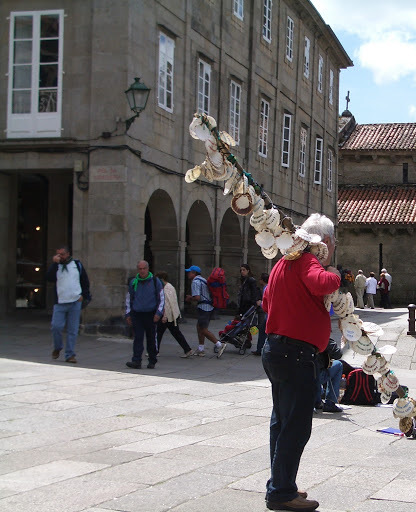 Christian pilgrims who made it all the way to their destination, at the far end of Spain, near the Galician coast, took home a scallop as proof that they had reached Santiago. 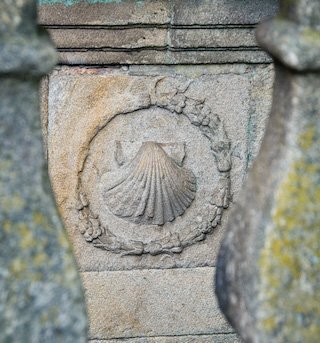 The scallop also became a symbol of the Santiago de Compostela pilgrimage: like the ridges on a scallop, all the pilgrimage routes started at different places but ended at the same spot. 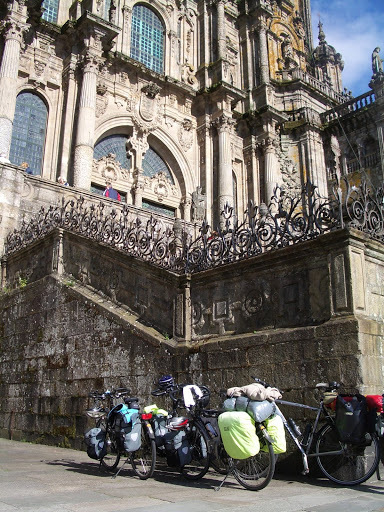 Today Santiago de Compostela is still packed with visitors–instead of Christian devotants with pilgrim staffs, they are backpackers and cyclists who have come for hundreds of miles on one of the various caminos de Santiago. And just as they did a thousand years ago, they all gathered in the cathedral at noon for the pilgrims’ mass. The priest offered a beautiful sermon in Spanish about devotion to God. Then masses were sung in Latin, and we all took communion. Then came the part that everyone was waiting for. There was a huge incense burner suspended by a thick rope from the ceiling in the middle of the chapel. It was packed with incense and lit. Then a group of about six men pulled on the other end of the rope–like a pully–and hoisted the giant incense burner, called the botafumeiro, into the air. Then they started it swinging. It swung back and forth, longways through the cathedral. Then they let more rope out and got it swinging even further, so that it was swinging all the way to the ends of the cathedral! It was unreal! And of course, the mass itself was very moving. The priest’s message was simple but rang true. And all the modern-day pilgrims, with their hiking boots, unwashed hair, trekking poles, had traveled hundreds of miles to hear it, and to partake in the spirit of pilgrimage. Fantastic. Your adventure sounds wonderful.It reminds me so much of Jerusalem – the fact that you are exposed to different religions and finding inspiration in them. I love the quote from brother Seeley.Keep the posts coming; I want to hear everything. Does the rain really stay mainly in the plain?You do look spectacular in Spain. Samantha is going to finish up her European hiatus by doing 6 days on the el camino and then flying out of Madrid. Weird and very cool that you were part of it too. I am planning to think deeply on the pilgrimage comments that your professor made…Someday I’d like to do the whole thing but for now I’ll just work on my own personal pilgrimages here at home.